If Philadelphia Flyers defenseman Jason Smith wasn't a hockey player, he probably would have taken a shot at living the life of a fireman. "I remember those elementary school field trips to the local fire hall and I always thought it was great how active everyone was in the firehouse," Smith told NHL.com. "It's almost the same kind of team atmosphere you'd see in a hockey dressing room, which is why I think I liked it so much. I think it would have been something I would have enjoyed doing if I wasn't playing hockey." That's rather appropriate because in a strange twist of fate, the Flyers' captain has actually taken on the role of fire chief as his team struggles to douse the flames that have consumed what was a promising turnaround after missing the playoffs one season ago. After snapping a franchise-high 10-game losing streak last month, the Flyers and their first-year captain are 5-2-3 in their last 10 games, but are coming off consecutive losses to the Maple Leafs in a home-and-home series. Still, Philly holds the eighth slot in the Eastern Conference playoff race. The team is four points ahead of ninth-seeded Buffalo and one point behind seventh-seeded Boston. "It was a disappointing stretch, but as a team, we had the guys in the room aware of what it would take to turn it around," Smith said. "We're confident and still in a position to make a good run. Having been around and being able to see, firsthand, what goes on during the stretch run, I can tell you that getting to the playoffs is a battle on its own. Once you're there, it should be viewed as an opportunity. It makes no difference whether you're the top seed or the eighth seed in your conference. If you go out and take it to the next level, you will always have a chance to do well." The 34-year-old Smith should know. He was captain in Edmonton during the 2005-06 season when, as the eighth seed, the Oilers advanced to the Stanley Cup Final for the first time since 1989-90. After eliminating both top-seeded Detroit and fifth-seeded San Jose in six games and then sixth-seeded Anaheim in five, the Oilers fell to the Carolina Hurricanes in a thrilling seven-game series in the Cup Final. Smith, incidentally, was the longest serving captain in Oilers' history (2001-07), longer than Wayne Gretzky (1983-88) and Mark Messier (1988-91). It's a little-known fact that has certainly helped Smith earn League-wide respect. He was honored by the Oilers with a video presentation prior to their game with the Flyers on Oct. 6 and received a standing ovation from the hometown crowd. 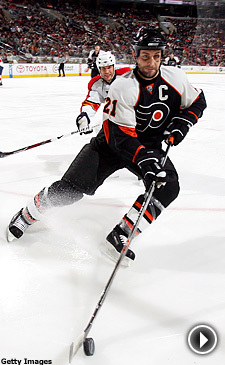 Smith admitted he was surprised when Edmonton dealt him to the Flyers on July 1, 2007, along with Joffrey Lupul, for Joni Pitkanen and Geoff Sanderson. "I was shocked a bit, but remember the season we went through before in Edmonton and how disappointing it was," recalled Smith of Edmonton's last-place finish in the Northwest Division in 2006-07. "Because of that, everyone on the roster expected something to happen and it was just a matter of who and when it was going to happen. I happened to be a part of that, but it's been an exciting change and I've been very happy in Philadelphia." Despite the tough stretch in mid-February, Smith realizes there's no time to panic. "It's important to keep things positive," he said. "I think every team in every sport goes through a stretch where things don't go very well, but you just have to keep a positive outlook. You have to realize that if you work hard, things will eventually turn in your favor." Black eyes and chipped teeth are common for Smith, whose willingness to sacrifice his body for the good of the team has always been of utmost importance. Smith leads the Flyers in blocked shots (183) and hits (119) through 71 games this winter. In Edmonton, Smith led the team in hits for six of his eight seasons with the team. During Edmonton's unforgettable playoff run in 2005-06, the veteran of 14 NHL seasons he led the club with 176 blocked shots and 151 hits. "It's important to stay physically fit and take care of yourself in the offseason," Smith said. "The game has changed; it's more free-flowing and there's more speed involved. So, it's important to keep yourself in good defensive position in order to remain competitive at a high level." Smith plays with an edge, no doubt, but there isn't anything specific that raises his ire in the heat of battle. "Nothing specifically gets under my skin," Smith said. "It's a game and obviously, things happen, so when you go out and play and compete at the highest level you want your team to do well. When you don't win, it's disappointing, so it's just a matter of going out and playing hard every shift."